Does the turtle perceive Steve as “finger food”? Like the well-oiled machine we are, Steve, Ken and I plan our meals down to the last granola bar. Which we usually split three-ways on the fourth day of our week-long trip. It’s a simple system. I’m in charge of breakfast, Ken makes lunch and Steve takes care of supper. Breakfast generally consists of prepackaged freeze-dried egg specialties with exotic-sounding names such as Backpacker’s Southwest Skillet, Trail Omelette and Eggs Benedict Arnold. The foil pouches they come in are designed to feed two, so I have to add a few ingredients to stretch them out. I’ll add boiled potato cubes, dehydrated cherry tomatoes and maybe a few grubs. The person in charge of the meal cleans the cookware and foil pouches afterward. One evening, Steve went down to the shore to rinse out his cauldron and the foil pouches from his chicken. A few minutes later, we heard him yelling for us to grab our cameras. Thinking that maybe the women from the Central Ontario Naturists Club were paddling by again, Ken and I dashed down to the shore. 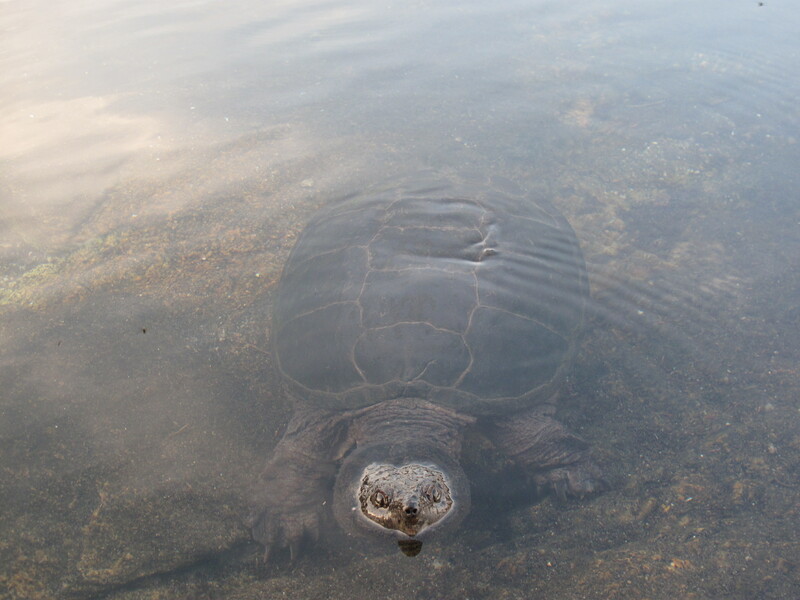 There in the water, inches from Steve’s hand, was a huge snapping turtle. 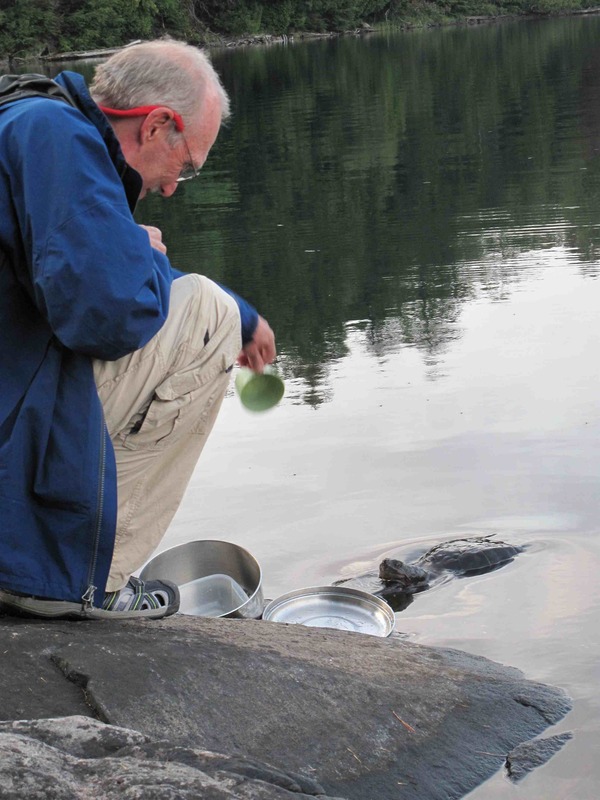 From the way the turtle acted, it was clear that it regularly worked this spot looking for handouts — or hands — from campers washing their dishes. We had a lot of fun photographing the turtle and trying to talk Steve into dangling a finger in the water. Ken named it Shelly or Sheldon. We didn’t get close enough to tell whether it was female or male. As we sat around the campfire that night, we couldn’t stop talking about the turtle. Although it was only a foot and a half long, by the time we were done talking about it, the turtle had grown to nearly three feet. Across. When I woke up the next morning, I grabbed my pack towel and Dr. Bronner’s biodegradable soap and headed down to the shore to bathe. Then I thought better of it. After seeing this behemoth, a cool dip in the lake didn’t seem all that inviting.